Why are all Net-Zero homes so %#$@%* UGLY ?!?!?! AMG Architect Sites > 2e Architects > Articles > Why are all Net-Zero homes so %#$@%* UGLY ?!?!?! What is a Net Zero House? Imagine never having to pay a utility bill for your house. Wouldn’t that be great? Run the heat in the winter and the AC in the summer and watch the electricity meter run backwards. Reduce your environmental footprint and design a house that relies on its placement on your property, the architecture of the house, and technology to make your house a zero energy building. By definition, your home is a net zero energy building (NZEB) if the annual energy usage of the home is about equal to the renewable energy created by the building. Sounds simple, doesn’t it? How do you Design a Net Zero House? Designing a Net Zero home is a very difficult task. You must examine all the potential items that will use energy and find the most efficient models. For Net Zero homes, the first priority for the architect is all about energy. Energy conservation, creation, and consumption become the heart of every decision. Unfortunately, in this scenario, the people that live in the home are, at best, are a secondary concern. The most efficient refrigerator may not be the most attractive or functional for the family who will live in the house. Net zero house architecture is also focused on insulation and air infiltration also known as how air tight is the home. When a house is air-tight, there’s no exchange of air between outside the building envelope and inside. The home then needs to be mechanically vented requiring additional, energy consuming equipment. You must also eliminate any obvious holes in the home, including fireplaces–a chimney is essentially a hole in the insulation envelope of the home. You will also need to orient your home so that most of the windows face south or east, with only a few windows facing west and no windows facing north. Unless you have a very large property and have the ability to choose the exact house placement, this can be hard to achieve. Plus, what if the best view on the property faces north? You must also look at how to create, capture, and store energy. Think about solar panels all over the roofs, windmills, natural energy sources including hydropower and geothermal. The list goes on and on. 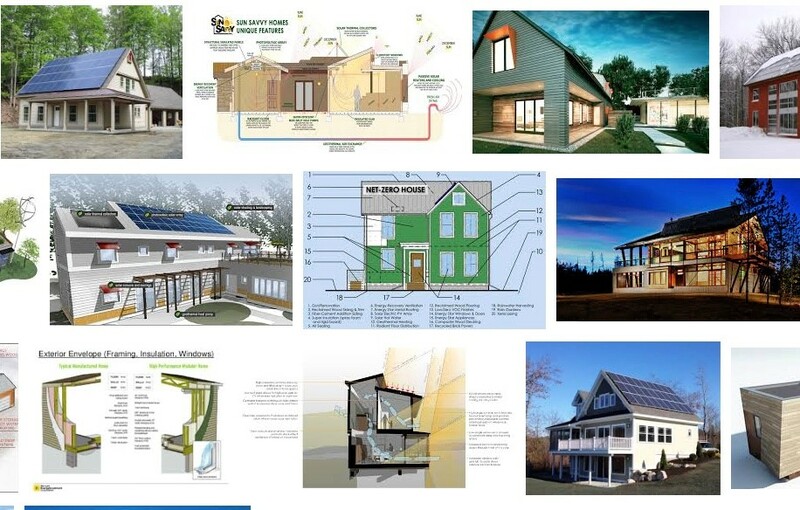 A quick Google search on the ‘design of net zero homes’ netted me the following images. Uninspired, would be a kind description… These are examples of how the singular focus on net zero to the detriment of all of the other considerations ends up. Designing a Net-Zero home is not easy, but it is a great goal, and it can be done. There will be hard choices to make. At times, the choices will be between what enhances the enjoyment of the home of the occupants and net zero. At times, the choices will seem totally at odds. This is why you have to set a priority and find a balance. 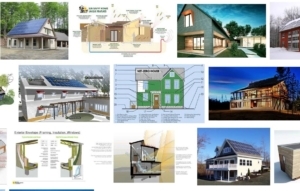 2e Architects has worked with clients in the Baltimore area who want a net zero house. Our philosophy has been that the priority must always be on the occupants first and then we add in energy efficiency at every single opportunity, but we strive to create a balance. We focus on the vistas and letting the natural setting of the home dictate the architectural decisions we make. We won’t sacrifice a breathtaking north facing view by not putting any windows on that side of the house. We look for smart technology like geothermal to heat and cool the house. We’ll utilize solar panels, but instead of placing them on the main structure, if the property has outbuildings, we’ll place the solar panels in more discreet locations. We’ll work to orient the house on the property so that in the winter when the leaves have fallen off the trees the house benefits from the solar warming, but in the summer when the trees are full of leaves, it is shaded. We’ll incorporate natural building materials that are both beautiful and functional. We’ll create a water retention system that captures rainfall and a system for grey water for second use. We’ll look for smart ways to handle air exchange and make sure the home doesn’t feel like a closed in, hermetically sealed box. With our clients Craig and Judy, we failed at creating a Net-Zero home. Instead we created a Nearly Net-Zero home that is extremely energy efficient and LOVED by the occupants. I count that as a huge success. You can view details of their net zero home in our portfolio. Check out our series of guidebooks that get you started with planning and designing your luxury dream home. Learn how to find and select an architect--what questions to ask, how architectural services fees work, and more. View all of our free guidebooks available for download. 2e Architects also has several informative video tutorials. A Conversation Between Two Falcons? What Do Falcons Do at Night? © 2019 2e ARCHITECTS. ALL RIGHTS RESERVED.